Commercial and Residential Conveyancing including sales and purchases. Leasing including Retail and Commercial premises, major buildings and shopping centres. All aspects of Property Development. Business Law and Commercial Services. Acting in relation to the acquisition and management of Retirement Villages and Units and Aged Care facilities. Superannuation, Trusts and Estate Planning. Wills, Probate and Estate Litigation. Claims for Compensation for Acquisition of Land. Environmental and Local Government Law. Clients who are in business or who intend to go into business need the advice of professionals who fully understand the intricacies of business law. 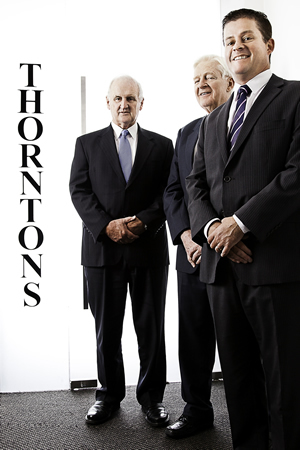 The lawyers at Thorntons have that knowledge and experience. We strive to carry out all matters as speedily and cost-effectively as possible and in accordance with each client's needs.